Christmas Eve Message - Hope Has Arrived! A short reflection after hearing Luke's Christmas Story. What would life be like for you if you ditched fear as the angels tell us to? December 24, 2013 - 4:00 Sermon from FUMC of Arlington on Vimeo. UPDATED: Hope is on the Way! I've been kind of silent on my blog lately, and I can finally share the reason why! For the last two months, I've been working on a writing assignment for GBOD Worship - sermon preparation ideas for the Hope is On the Way Advent Series I helped to put together for my faith family at FUMC Arlington. It was a tall assignment, working out seven sermons a couple of months out, but it was a really fun project and a blessing to get this opportunity! The GBOD published it all today! So, if you're looking for a little bit of help with your sermon preparations for Advent, Christmas and Epiphany, I hope you'll check out what we've offered. With these notes, I also wrote out a few ideas each week for you to discuss with your worship planning team, questions to ask and ideas for you to own your worship this season and glorify God in your context. Combine them with the liturgy resources we have, and it's a comprehensive resource to serve your congregation! It's all free, but I'd love for you to comment if any of this is of help to you, or if you have a different perspective than from what I've given! One of the many blessings of working at the church I'm appointed to is having a trained graphic designer on staff who takes on most of our communications needs. She doesn't just make fliers (though she does), she also manages our website, email communications, and designs our publicity materials for our various campaigns and sermon series. As pastor of communications, I don't have to do the tricky stuff ... I get to deal with overall vision and scope, while my team does a stellar job of bringing our big ideas to life. I don't know if you're church needs it or not, but we're offering our main graphic for our Advent series here for free. It should give you a lot of room to use as you're church needs, for bulletins, fliers, banners ... Whatever you need. As always, if you use it, just leave a comment to let us know how far it's gone! You can also check out worship helps for the Hope is On the Way Series here. And sermon notes at the GBOD worship site here. 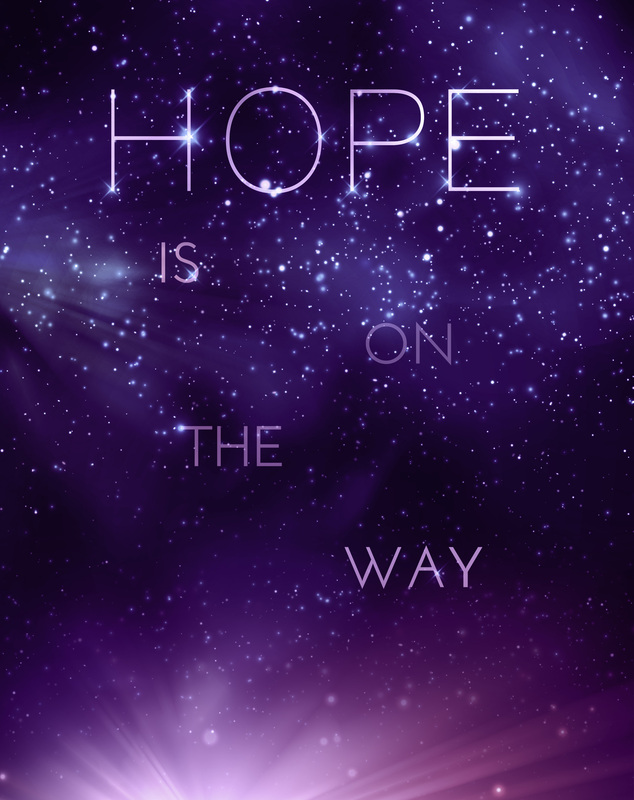 Advent Sermon Series - "Hope is On the Way"
A couple of months ago, my senior pastor, knowing my liturgical nerdiness, tasked me with putting together our sermon series for the season of Advent through Epiphany Sunday (this year December 1 - January 5). At our church, for the most part, we follow the Revised Common Lectionary and build our sermon series out of that, following at least one Gospel/Psalm/OT/NT stream for a month or more. Looking through the Gospel lessons for the season going into Year A, I knew the Gospel's would be the way to go. After all, while all years of the Lectionary justifiably spend time with Mother Mary, year A is the only one to truly spend time with Joseph, Jesus' adopted earthly father. To break down and explain the plan for each Sunday, I've included the scripture chosen, key verse from that scripture, and key words and key themes to aid in hymn selection and sermon preparations. As a nerd for the church year, I'm not too crazy about including Christmas hymns at the start of the season. I think it's okay to build those in as we lead to Christmas Eve, but it's important to note that this is a season of anticipation as we spend a lot of time with prophecy from Christ and John the Baptist. So, when it comes to building up the Christmas theme - pace yourself. Remember, Advent is a season of past and future collision in the present ... A time of already here (as in Christ did come and is here) and not yet (Christ will come again. If you focus on Christmas too early, you miss the point of the season. To aid in worship, I've also included a Call to Worship, Candle Lighting Liturgy, and Prayer of Confession for each appropriate Sunday. At our church, we'll have a family light the candle and a liturgist follow that with the Call to Worship. Feel free to use any and all resources. If you do use them in worship, please leave a comment! Possible Theme: Jesus, close to the end of his earthly life, prophesies another beginning. Jesus, the Messiah, tells the people to watch out for the Messiah. Jesus goes meta. It was Jesus Christ himself that told us to be ready at any time. So, today we remember that call. The call to look for God in unexpected places, at unexpected times. And even though we wait, we can expect Our Savior to show. This morning, we light the Candle of Expectation. Let this fire remind us that while we wait for the Lord, truly the Lord is already here. Hope is here. Love is here. Family, is here. We gather this morning as a people waiting for the Lord. The one who died, rose, and will come again. Yes, this is the truth, and the great mystery of our faith! Yes! Lord Jesus, come into our hearts again this Advent Season! Everlasting God, we confess that we haven’t been watching. We haven’t been looking out for you. Like a thief in the night, you could pass us by and we would never know. We have forgotten to look for you in the faces of our children, of the homeless around us, in the immigrants who struggle as they serve even us. Forgive us, we pray, and make us ready to greet you in everyone we see on the street as we leave this place. Amen. Key verse: Matt 3:2 - "Repent, for the kingdom of heaven has come near." Possible Theme: We journey backwards to before Jesus’ baptism, to John the Baptist prophesying the Messiah’s coming – a Messiah already here. Now is the time to get right with God. John the called on God’s people to repent, for the Messiah was near. The people had prayed for it, yet they didn’t see the one they had been waiting for was truly among them. That prophecy was being fulfilled in their midst. Today we to turn to God. The Kingdom of Heaven is near. Lord, help us to spread the good news! Merciful God, though your prophets still call out to us, millennia later, we still don’t change our lives. As John the Baptist shouts to the people, “Repent, for the Kingdom of Heaven as come near!”, we know that you are here, and still we don’t change. Still we don’t hear the cries of the needy, still we don’t prioritize serving the poor, and still we refuse to meet the needs of those who are truly hungry and thirsty around us. And yet, merciful God, you still count on us to carry out your mission, you still encourage us to follow you, you still are near. Help us, Lord, as we seek your way. Amen. Key verse: Matt 11:3 - [John in prison asks] "Are you the one who is to come, or are we to wait for another?" Possible Theme: The ministry of John the Baptist is validated in Christ. The hopes in John’s heart are fulfilled in the statements of Jesus, the one the world had been waiting for – who was, who is, who is to come. All of the hopes and dreams of God’s children were wrapped up in that question. And the answer was, yes, the Hope of the Nations was there, and is here. This morning, we light the Candle of Hope. Together, let us be a people unafraid to hope! Christ comes to us in the unexpected! Let us keep the faith together – that Christ will come again. Lord, keep us on the straight and narrow path that leads to you! Our Lord and Our Hope, we know that we often fail you. We forget to watch. We forget to wait. We make the holiday season more about ourselves than sharing the hope that only you can bring. We get so caught up in what we’re supposed to get this season, we forget what we’re called to give. Help us to remember that this season is about the message and ministry of your son, Jesus Christ, the one who came to heal, liberate, and share the good news of your faithful love. Call us to be faithful only to you this season. Amen. Key Verse: Matt 1:20 - "But just when he had resolved to do this, an angel of the Lord appeared to him in a dream and said, "Joseph, son of David, do not be afraid to take Mary as your wife, for the child conceived in her is from the Holy Spirit." Possible Theme: What about Joseph? Here we have the rarer-read birth narrative from Matthew, focused on the choices of Jesus’ earthly father, Joseph. What can his awkward circumstance tell us about keeping the faith? As we wait for Emmanuel, God with us to arrive, we remember the fears of his earthly parents. We remember the commitment of Joseph, we remember the commitment of Mary. We remember that the Lord sent angels to comfort and to guide – with joy. In that spirit of joy, of expectation and hope, we light the Candle of Joy. With joy we call Emmanuel down to meet with us this morning! Through the birth of Christ, we know God’s love for us. God of our salvation and author of our hope, it’s hard for us to see the blessings you have for us. We think that our plans are better, that the things and desires of the world are higher than your ways. You, Lord, are the great interrupter and sometimes we can feel inconvenienced by the calls you put on us to seek justice, love mercy, and walk humbly with you. Remind us that this season that leads to Christmas wouldn’t be here at all if it weren’t for you loving this world that you made. Thank you for loving us, God. Amen. Possible Theme: The shepherds were awake to receive the good news, while the rest of the world was asleep. With this lighting of the Christ Candle we rejoice with prophets, angels, and Mary and Joseph in welcoming Christ! Thank you God, for sending us your Son. May this light remind us of the hope we all carry because you love the whole world! Possible Theme: In Paul’s writings, he looks at Christ’s life, Christ who called us brother and sister with him as we are children of the Father. Christ our teacher, also called us family. … God stands with us. … God shows faith in us. We are all family in Christ, and with Christ. Thanks be to God, for this amazing news! Key verse: John 1:16 - From his fullness we have all received, grace upon grace. Possible Theme: Since the beginning of all things, God has been giving to us. And God hasn't stopped giving to us. So what do we do with that? The Word of God has been with us from the start! The Word of God is with us even now! May the Lord’s grace and peace be with us in the start of this New Year! For further help, I've partnered with the GBOD to offer sermon starters for the series! Just go here for a few ideas to start your sermons and get your whole worship team thinking about the season. On December 8, 2012, our worship ministry presented our annual Christmas Gala. It was time to sing big, beautiful choral music, and it was also a time of worship and prayer. This year the gala, We Pray for Peace, was focused on praying for the peaceful kingdom to finally come into fruition around us - and to ask God what it is we should be doing to help bring that kingdom about. The 'meat' of the program was Gloria, by Antonio Vivaldi. One of the more accessible master works in the canon, this neopolitan setting of the Gloria text of the Catholic Mass is just a lot of fun to sing. Our primary instrumentation for the evening was a string quartet (the Gloria just isn't right without them), as well as piano, organ, and a little acoustic guitar for fun. As is tradition in our faith family the event is intergenerational with our Chancel and Youth choirs combining voices for the service. The Chancel Choir carried the brunt of the Gloria, and the Youth Choir offered anthems with a little more 'contemporary' feel. Our bell choir also participated in a mighty way. The program is presented in three acts. The first act, "The Prophets Knew ...", focuses on that peaceful vision of Isaiah. The second act, "We Call on the Lord ..." begins with a plea from the psalmist as we pray for a change to come into us and to the world. Here we pray for the world we live in today. In the third act, " ... And the Lord is With Us! ", we tell the Christmas story. I've been told that every sermon should end on a hopeful note, so we closed with the Hope of the Nations, born unto us. In our telling of the Christmas story, we focused on the readings that included the angels. I'll be including commentary and links to resources throughout the liturgy of the program. Feel free to use any or all of this program, and may the Peace of Christ be with you as you jump into 2013! We began the service with both choirs processing to this beautiful, hymn-like anthem while holding candles. Do you hear the angels sing? They’re singing Glory to God! They’re shouting down that Peace has come! Listen to the angels sing! Give us peace, O Lord. Our youth pastor shared this short introduction to the journey of the service. It was not printed in the program. Glory be to God in the highest! And on earth peace to men of good will. We praise Thee, we bless Thee, we adore Thee, we glorify Thee. We give Thee thanks for Thy great glory, O Lord God, heavenly King, God the Father almighty and to our Lord Jesus Christ, the only begotten Son. This anthem setting of Isaiah 11:1-9 is stunningly beautiful. It also comes with a bell choir addition to the accompaniment. Our youth choir presented this praise and worship setting of the advent carol by Charles Wesley. Lord God, Lamb of God, Son of the Father who taketh away the sins of the world, have mercy upon us. Who taketh away the sis of the world, receive our prayer. Who sitteth at the right hand of the father, have mercy upon us! This plea comes to us from Brazil and can be found in Global Praise 3. Our youth choir lifted it up. This baritone solo is the original setting of UMH 164. It works very well with organ accompaniment. We used this intercessory prayer time as an opportunity to bring two monastic communities together, Iona and Taizé. We took our time here and didn't rush through. A touching setting of the hymn for bell choir. It's not overdone in the least bit. … And the Lord is With Us! For thou alone art holy. Thou alone art Lord. Thou alone, O Jesus Christ, art most high! Together with the Holy Spirit, in the glory of God the Father. Amen! Up to this point the Chancel Choir had sung all of the Vivaldi. We had the Youth Choir join us here. I couldn't let them out of learning at least a little bit of one of the great choral works ... And they loved it. From the Gospel of Luke 2:1-7 Jesus is Born! And that's a wrap! Total time of the program came in at an hour and a half, and we wouldn't have changed a thing. But is there anything that you would have added in or taken away? A few months back I had heard of this idea, Christmas Business Cards for the church. It's all pretty simple, draw up a business card with your Christmas Eve service times on one side and generic info about the church on the other (regular service and Sunday school times, website, contact info) and then scatter them to the wind in your local community. Super simple evangelism ... But not particularly intentional. A theme that I've been following in conversations lately is the true importance of Christmas Eve in the life of families, and not just in the churched - but also in the unchurched. For many, Christmas can be a hard and lonely time, and a time of big questions. Even in our secular understanding of Christmas, it's a time of gift-giving, family meals, and taking stock of our blessings. Has it become ultra-consumer driven? You bet. But I'm of the mind that the heart of the season hasn't drifted so far off course that it can't be put back on track. But what's the track it needs to be put back on? That the reason Christ came to the earth was to bring the Good News of Salvation to the least, the last, and the lost. God started things off with the very family Christ was born into ... a blue-collar, working-class family. Most of our congregations have an influx of visitors on Christmas Eve, people looking for answers. Sure many of those visitors are family members who've travelled in for a visit, but if we look around, our first-time visits are way up. But what if we didn't wait for Christmas Eve to get people inside our doors? This year our Evangelism and Worship teams will be partnering to do something big. The idea is building off of something that the Downtown Campus of Church of the Resurrection began a couple of months ago with their E.P.I.C. idea to simply, intentionally, share random acts of kindness around the local community - through simple business cards. And if you know anything of the Church of the Resurrection evangelism model, they do a lot of work to bring their A-game on Christmas Eve. As a faith community they make themselves ready for their guests on this special night, making sure everyone knows about the faith community before leaving worship and they are so very welcome to come back to their regular worship services - even going so far as to advertise the upcoming sermon series and studies in the New Year (imagine that). So what are we at FUMCD going to do to make the season special? We'll have our simple business cards made, with the Christmas Eve services on one side, and generic info on the other. Then, on December 16 we'll hand them out to the congregation, ask each member to take just one card and give it to somebody they know that is unchurched. It's kind of hard in today's climate in our churches to remember that the idea of the Gospel is to spread it, and in our increasingly secular time, we are growing up more unchurched than churched people. And yet - through our retail-based lives Christmas is still relevant. So why don't we take it back? The idea here is to be intentionally invitational ... And that will make a lot of people uncomfortable, but there's another term here we need to take back for all Christians, and that is evangelical. It's the job for all of us who call ourselves Christian to be evangelists - it's not meant to be a political term. I'll get off my soapbox on that one now. But, what if we encouraged each member of our congregations to seek out one person or family that they know to come to church on Christmas Eve? And not only that we encourage them to invite that family, and then sit with them. It's so simple, and God will reward us even if we just try. Just imagine that good that could happen. Draw up the Christmas Eve Business cards. Early in the Advent season, encourage the church to pray for the unchurched in the local community and even to think of a few people they know. On December 16 (just early enough) hand the business cards out to the church, encouraging them to invite one unchurched individual or family to Christmas Eve worship with them. On Christmas Eve - be ready to welcome the guests with a little gift and plenty of info about the church. It doesn't have to be hard ... Sometimes we just have to do something. What is your local church doing to bring people to Christ during the Advent/Christmas season?